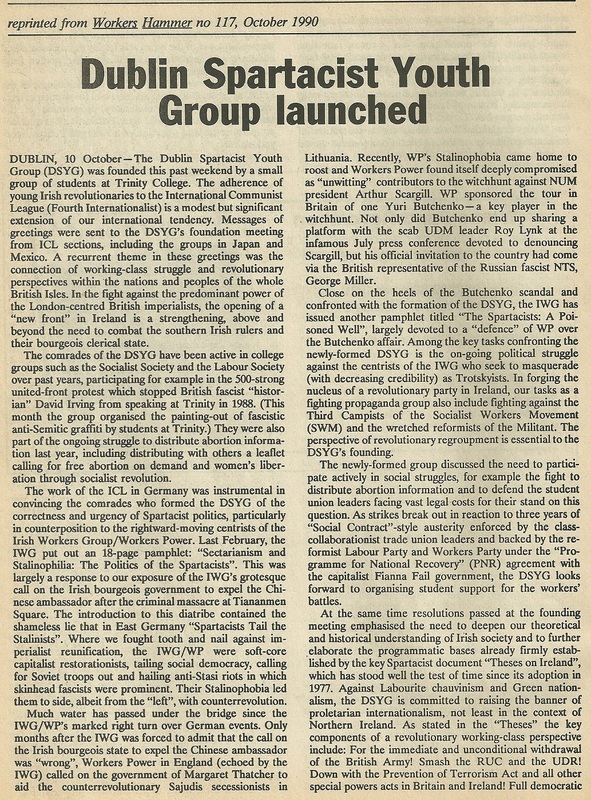 Reprinted from a 1990 issue of Workers Hammer the news that “Dublin Spartacist Youth Group Launched” outlining why there was the need for the group. The Autumn/Winter 2004 edition of “Spartacist Ireland” produced by the Spartacist Group Ireland. It was the sith of 8 editions of Spartacist Ireland that were produced. Contains pieces on The aftermath of the 2004 European and Local Elections, The Citizenship Referendum , these contain various attacks on the SWP, Socialist Party and others . Also includes pieces on the Ukraine, Iraq, Marriage and the Capitalist State.I’ve uploaded it in PDF format here (page 7 is missing from the pdf but included below.